These glass spice jars are available on Amazon here. If you are close to a Bed, Bath and Beyond they have them there that you can buy individually also. If you are prone to messes like I am, this stainless steel funnel will help keep the spices inside the jars instead of all over the counter. 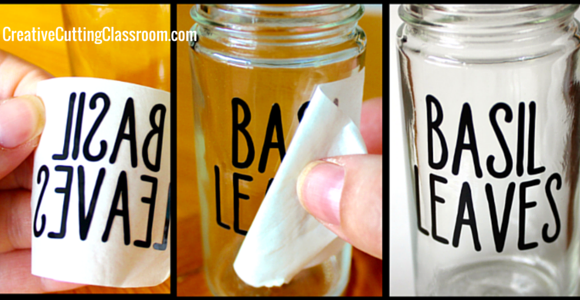 My labels are sized to these specific jars, but if you need a different size the file can be adjusted as needed. To figure out the size I needed the words to be I measured the glass from top to bottom, which was 3" on these jars. I then measured from side to side where the words would go. I figured that 2" would be a little too wide so I tried to adjust the words between 1.5" and 1.75". Okay, so this is the step I am always tempted to skip because I just want to GET ON WITH IT but I have to stop and remind myself that projects are made or screwed in this stage. Seriously, peel the labels off and then wash any residue with warm soapy water. Let them dry while you are getting your vinyl ready. It's always a good idea to also swab the area you are applying the vinyl to with alcohol to remove any oil residue from your fingers. Select the image and select "actions" and then "detach". I have all of the names attached so that when I went to cut it they would stay in place and Design Space wouldn't rearrange them on the cutting mat. Select and delete any spices you don't want. To add a different spice select the "text" icon. Type the spice name. If it is more than one word I hit enter after each word. Change the font to Cricut's "Four Seasons Home Decor" (a $4.99 font). Resize the name to approximately 1.5" to 1.75" wide after hitting "edit". If you need to adjust the space between a multi word name select "edit" and adjust the "line space". After you have all the spices you want, arrange them to save space. Once they are laid out how you want them select them all and select "actions" and "attach". Turn the dial to vinyl, select "go" and cut those babies out! I kept the vinyl on the mat while weeding but I would recommend taking the vinyl off of the mat to weed it because my arm kept sticking to the mat! Make sure you remove the entire thing, including the backing layer. Take your scraper or a credit card and rub it over the entire thing. Slowly begin to peel up the extra vinyl leaving only the letters. Go slow and if any letters start to come up put a little back down and rub that spot and try again. The next step is applying the transfer tape. Cut it to the size of your project and lay it over your words. Take your scraper or credit card and rub all over. At this point cut around each spice name. Make sure your jar is clean and dry. Peel the liner off the back of the transfer tape. If it tries to take any of the letters with it put it back together and rub again. Place the label on the jar and rub again. Slowly begin to peel away the transfer tape making sure all letters are staying on the jar as you peel. Rub your fingers over the label to make sure it is on well. Tada! Rinse and repeat for all of the jars and then marvel at your creation...beautiful labeled spice jars.